Whether you need fast and reliable wireless internet for home or business, Wibre brings you a selection of products designed to suit your needs. With data speeds ranging from 4mbps all the way to 100mbps, things just got a whole lot faster. Depending on your location and specific requirements, we help get you connected quickly and simply. Our wireless products offer unlimited speeds straight to our data center in Cape Town, while additional data services are also provided to help you customize your connectivity even further. From installation to ongoing customer support, we pride ourselves on our high level of responsiveness. Unlike traditional ADSL, which can take weeks or even longer to be installed, we help you get up and running as quickly as possible. You can make the switch from your current ADSL connection in your own time too, ensuring minimal disruptions in continuity. Our network is also fully owned and managed, giving us full control and allowing you a single point of contact at all times. Another benefit to this independence is total resilience. This means that any issues with the exchange or cables will not affect your connection. Both upload and download speeds are kept equal. For example, if you are on a 4mbps package, you will get 4mbps up and down. Our high speed, high quality wireless connections are committed too, with a variety of speeds starting from 2Mb and ranging up to 100Mb or even higher on special request. We are fully licensed by the Independent Communications Authority of South Africa (ICASA), who regulates the industry. Sadly, we can’t say the same for some of our competitors. We are able to peer with other providers at peering points, thanks to our own IP ranges and ASN number. This enables us to peer at multiple locations, in turn giving you the best speeds possible. As a local business catering to other local businesses and home internet users, we provide a personal, dedicated service. Our phones are always answered, and we aim to handle all questions and issues at record speed. We have plans for both business and residential users. Click to find out more. What do you get when choosing us as your wireless internet company? Line of Site from one of our high sites to your premises is required to access the network. A site survey to determine this is provided at no charge. Business wireless services are unshaped and uncapped, allowing you full control of your needs. Low contention or dedicated bandwidth allows you to determine the best choice for your needs. Low contention for example applies to the number of users sharing the same data capacity. The lower the contention ratio, the higher the quality of service. Guaranteed dedicated connectivity is provided, giving zero contention with enterprise SLAS of 99.5% uptime. Depending on your connectivity needs, your wireless service can be upgraded to a higher line speed (or downgraded) in a matter of hours for optimal scalability to help your connection grow as your needs grow. Ability to combine data, Voip and video. No heavy congestion issues result in faster speeds and lower latencies. Our local bandwidth is provided via redundant fibre backbone using DFA, and our international capacity is provided redundantly via SAT3 and WACS international cable systems. We are able to install within days, as we do not rely on any 3rd party or cable provider. Plus, no land lines or fixed lines are needed, making installation even simpler. Ready for super-fast, reliable internet? View our pricing plans Now! Ready for the fastest, wireless fibre internet in Cape Town? We know you have questions, and we’ve got the answers! Wibre use a combination of Fixed wireless, high speed microwave and fibre optic technology to deliver broadband to your home or business. A small antenna dish is placed on your roof and aimed towards one of our towers. Why should I consider wireless internet? For a “simple” installation we charge R1500 excl vat. This includes 30m of cable, antenna, bracket, pole and testing. This is all that is needed to get you up and running. For business installations there is an additional R599 for a router to enable us to better manage your bandwidth for multiple computers. No, Our services point to our high sites which is typically only a few km away. Unlike satellite internet our services are faster due to the time data takes to get up to space and back to land. Yes, our technology requires line of site from your building to our high sites. We offer a free site survey to come and determine this for you. We are able to install for 95% of our received enquiries. Contention ratio is how many times the Internet Service Provider shares their bandwidth with other customers. For example ADSL is contended roughly 30:1. Our business services are only shared 3:1 meaning a much faster experience for our customers. With us you really get your speed. 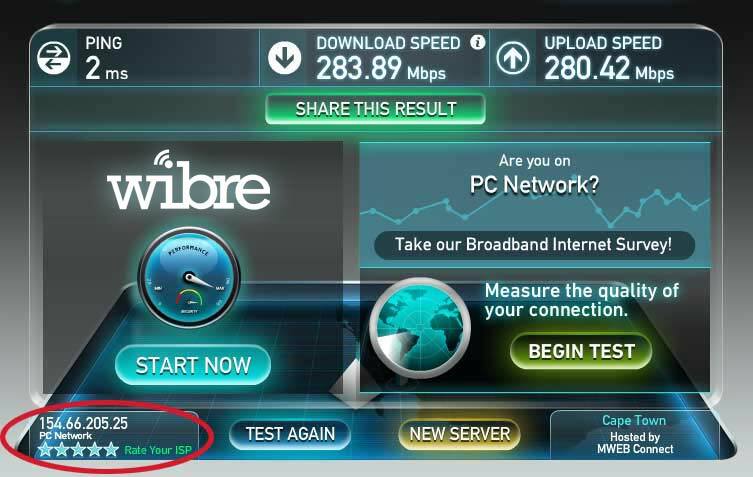 My business requires a static IP address, can Wibre provide us with that? Yes, in fact we are able to offer blocks of IP numbers should they be required. Yes, due to the fact that we offer symmetrical bandwidth, as well as make use of 17ghz microwave and fibre to our high sites, VOIP is never a problem on our network. Should you need a VOIP service we are able to offer you this. Yes, our service is designed to work like that. Does rain or any other weather condition affect my service? Our network is designed to withstand the effect of rain on RF signals. We provide a 99.99% uptime SLA. Can I run a server on this connection? Yes. Customers are able to run any services on our connection. No, this service is not for you if you want to run automated downloads for hours every day. Our service is designed for high speed and business customers in mind. I’m ready! How to I book a site survey? Fill out the form at the bottom of page and a representative will call you shortly. Alternatively, you can also call us on 0875500900. Alternatively, call us on: 021 286 1110 and get wibre today!